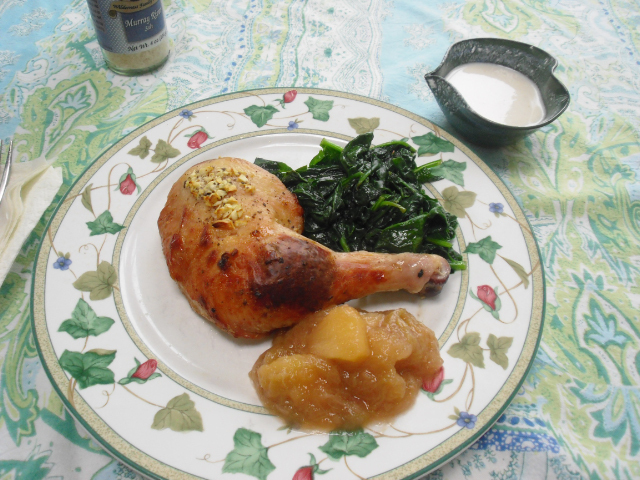 Buttermilk Baked Chicken Recipe with Side Dishes - Hartke Is Online! I recently found a recipe in Joy of Cooking (the first cookbook my mother ever gave me, because it served her so well over the years) for a Yogurt or Buttermilk Marinade. It makes a wonderful chicken dinner, the remaining marinade is heated through to serve as a hot sauce on the chicken. This easy dinner with two side dishes is a typical meal around our home. Whole ingredients, simply combined, and served piping hot in a casual setting. I have included the side dish recipes so you see how I tend to do things at the Hartke Lighthouse (our home is a sixteen sided oval home on a lake, so we dubbed it The Lighthouse). It was a stormy night, and golf ball sized hail fell into the lake, just as we were sitting down to dinner in our screened in porch. 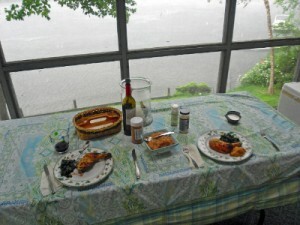 This oven baked chicken dish is a wonderful cook-inside, eat outside dinner for inclement weather. And with the dramatic storm, it turned out to be exciting and romantic all at the same time. The marinade recipe is so simple. Add chicken pieces and marinade for a few hours. When ready to bake, pre-heat oven to 350 degrees. Remove chicken with tongs and place pieces on a broiler pan, reserving marinade for sauce. Bake the chicken until clear liquid pours out when poked with a knife, about 40-45 minutes. In a small saucepan, heat the marinade until just before the boiling point. It should be steaming hot. We use pasture-raised chicken meat in our household so there is not the “fear” of pathogens from raw chicken, but it is still a good precaution to make sure the marinade is heated for food safety reasons. Bad bacteria are very heat sensitive. Serve with the chicken a small pitcher or bowl with a pour spout. I use a water-less electric skillet for making fruit sauces. You could use a double boiler or slow cooker, and may want to add a little water (2-3 TBL?) to prevent sticking. Add the above ingredients and simmer until mushy, about 10 minutes. 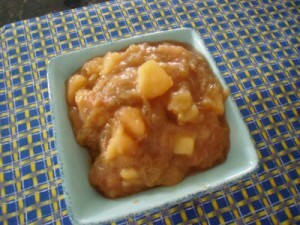 Remove to a bowl and chill or serve warm or room temperature. Since the marinade and sauce have a lot of garlic in them, I sauteed fresh spinach in bacon drippings left over from the morning breakfast (often I saute garlic with the spinach, but not this time). This takes less than 6 minutes to cook and add to the plate. Spinach is so nutritious, and my Popeye loves it! Brush bacon grease over the bottom of a deep saute pan. Saute bacon until it is wilted and cooked through, stirring often. About 6 minutes. Serve immediately. All of these ingredients were purchased from local farmers. So, now you know how a food blogger lives and eats! My motto? Keep it Simple, Fresh and Local! Please support your local farmers market. Your farmers are waiting to serve you! Here is a blog post I did a while back, which explains the economic boon local foods are to a state economy. 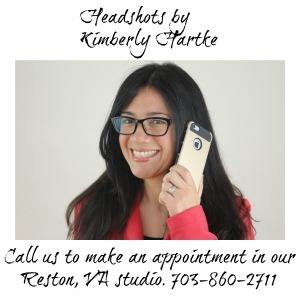 Kimberly Hartke blogs about raw milk, real food and the local foods movement at Hartkeisonline.com. Subscribe to her blog today for the latest scoop and delicious home recipes! Just found out that it is not too late to register for the How to Cook Real Food online course by Real Food Media blogger, Jenny McGruther. I plan to take the course, because you can always gain new insights from other home cooks! .-= Kelly the Kitchen Ko´s last blog ..May Round Up: Top 5 Thank You Links & Top 5 Posts =-. Hi Kelly, I have some fantastic pix taken the day Sally Fallon Morell spoke to us. I will do a post about that event! It was during the holidays, so you’ll see our home decorated for Christmas. I love to collect and experiment different delicious chicken recipes around the world. an insurer that has a strong balance sheet and reputation for good customer service. That includes people in the armed forces and people who have a vehicle sold, stored or reused.